The quarterly journal of the ALPO with the whimsical name The Strolling Astronomer started out as literally a cut-and-paste publication distributed to members of the organization as a means to exchange observing reports and data about solar system astronomy. This also includes information about individuals within the ALPO organization and the equipment they use. The first issues were mimeographed sheets with illustrations attached directly to them and then the pages bound together. In 1950, The Strolling Astronomer (or "JALPO") actually published drawings, photos, diagrams, etc. Today, the JALPO is published quarterly both as a hard copy (paper) publication as well as in pdf ("portable document format"), and includes a myriad of data which is based on conscientious, detailed, observing reports submitted by ALPO members and nonmembers. While much of the data is statistical in nature, many of the articles also provide how-to observing information for the serious amateur, as well as book reviews, etc. Which Journal format you receive — pdf or hard copy — is based on your ALPO membership. ALPO memberships which include only the pdf Journal are considerably less expensive because no physical printing, processing or mailing is required. Plus, this Journal is available for downloading as soon as it is placed online. ALPO memberships which include the hard copy Journal are more costly because these Journals require physical printing, processing and distribution. Plus, distribution can take several weeks after initial release of the pdf version due to regular printing and mailing procedures. 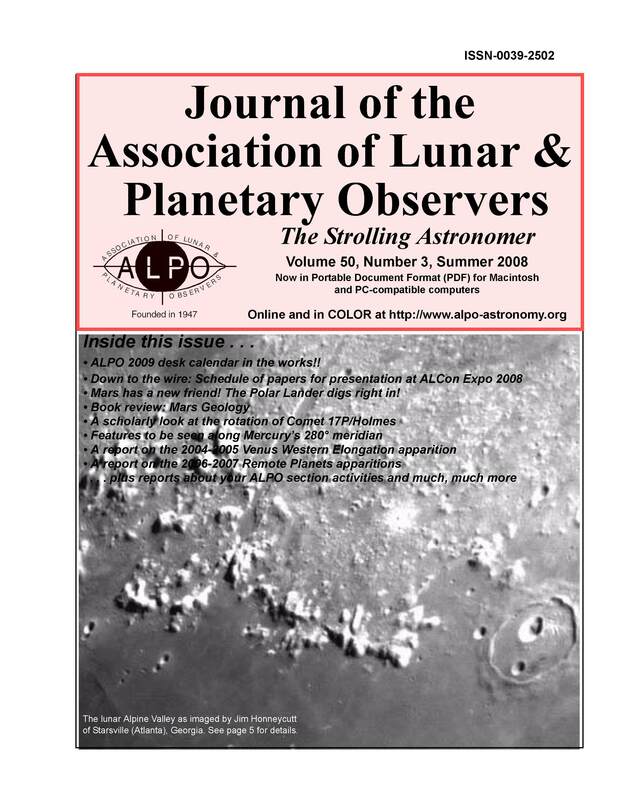 To help you decide which is best for you, please click on "The Strolling Astronomer" link at left for access to our library of pdf ALPO journals, many of which are now free; the newer issues require a password which is provided only to those ALPO members who have a "pdf" membership. The ALPO also offers both a Sponsor Member Level and Sustaining Member Level — both of which include the pdf AND the paper Journal. For a complete description of the ALPO and membership dues, click on the "ALPO Membership" button at left. All are in portable document format (pdf) and require the free utility "Adobe Reader" (version 5.0 or later) available at http://www.adobe.com.